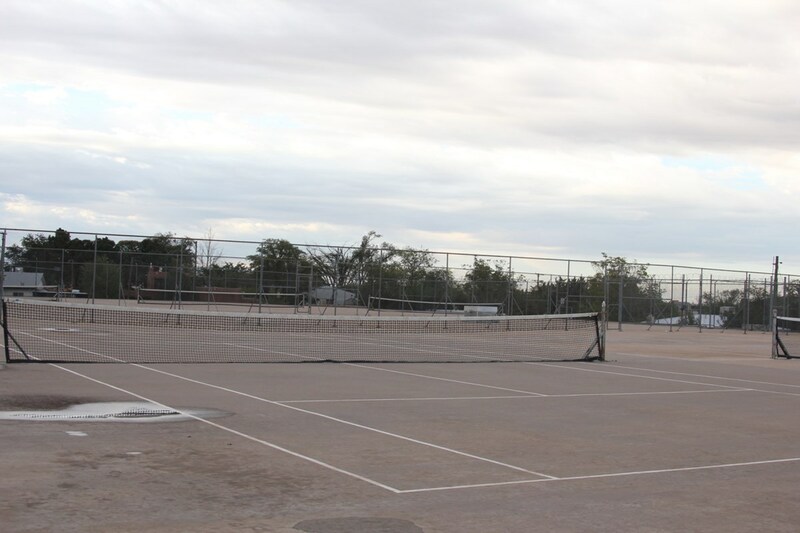 Almost 50 years old, the Zuni Park tennis courts are doing just fine. According to the Parks and Recreation Department, 32 public tennis venues exist in Albuquerque. Of the numerous public courts in the city, the six at Zuni Park are clearly the most unusual. “I would have to agree,” Dave Simon, the city’s Parks and Rec supervisor told me. Located east of Uptown, Zuni Park has none that area’s stylish pizazz. This is a small neighborhood of hard-working families, many of whom have lived there for decades. I first saw Zuni Park’s tennis courts four years ago. I was coaching a team from Cleveland Middle School and we had a match scheduled that afternoon at Zuni Park. I have lived and played tennis in Albuquerque since 1976. I had never heard of the courts nor did I know where they were. In fact, I needed a map to find them. When I arrived at the courts that day I remember being surprised. Six courts stood on atop a hill, set in the midst of Northeast Albuquerque. The surface of the courts was tan in color, which I had never seen anywhere. “Hey, Coach, this place is way cool,” one of the kids at Cleveland let me know. This past summer I started asking around about Zuni Park. I learned quite a bit of its history. I chatted with several residents but never once in all that time did I see anyone playing tennis, which bothered me. I don’t like to see empty courts. I think a lot of that had to with the brutally hot weather or the heavy rain. I decided to make some phone calls to city offices. After a while I was eventually given the name and number of Alex Morgan, the president of the Zuni Park Neighborhood Association. I asked him why the park’s tennis courts never seem to be in use. Victor Tafoya, I found out, lived directly across from the Zuni Park courts. His parents moved to the neighborhood in 1959. Tafoya, 49, grew up there when the land facing his parents’ home was a lonely mesa, a desert decorated with nothing but dirt and sagebrush. At some point during the mid-1960s, bulldozers arrived at Zuni Park. The mesa’s dirt was shoved forward and piled again and again until a large mound was formed. I learned that this hump of land was soon leveled so the city could erect a water storage facility—gigantic tanks set deep into the earth. The area between Mesilla Street NE and Espanola Street NE was to be usurped by the Albuquerque Bernalillo County Water Authority, an entity that remains in charge of the entire expanse of Zuni Park, save for the surrounding residences. With the water storage facility firmly in place, the city came up with the idea of smoothing flat the top of the mound and laying down six concrete tennis courts. That task is believed to have taken place about 1959 or so. Three of those tennis courts were placed on the north end of the mound three on the south end. On the west side of this vast concrete slab was the entrance to the below-ground water facility. The only people allowed into or near that installation are city engineers or technicians. A double padlocked trap door leads the way down. For three decades or more, the Zuni Park tennis courts were as busy as ants at a family picnic. Though the courts never had lights, they drew players. High school matches were contested there often and still are now and then. The courts were used for school tournaments and practices. Once upon a time, private lessons were offered at the courts. Last weekend, it so happens, the courts bustled with activity, courtesy of the city’s annual middle-school tournament, sponsored by the USTA’s Northern New Mexico Tennis Association. On a pleasant but windy Saturday morning I returned to the Zuni courts. There I talked with James Gee, who is the assistant tennis coach of Garfield Middle School’s team, the Grey Wolves. I wondered what Gee thought of the courts. “I wish they had wind screens.”” he said. “But really, it doesn’t bother the kids. They’re having a lot of fun.” They were indeed. They were practicing before their match began. Like many mid-schoolers, tennis balls were flying every which way, often in the wrong direction. Laughter followed and no one seemed to care. The Zuni Park courts were never just for youngsters, of course. In the 1970s two APS school teachers, Hank Paskiewicz and John Garrison were just getting interested in tennis. They went to the Zuni courts to practice on weekend afternoons because they didn’t belong to a private club. Afterward, the two men would go to the nearby Penn Station bar to have a beer or two inside its smoky confines. Eventually, Paskiewicz and Garrison became doubles partners. Over the next couple of decades they developed into a top senior doubles tandem. In fact, they dominated their age-group in the Southwest for several years. with her husband, Pedro Santiago. “He made me run,” she giggled. As a youngster, Victor Tafoya practiced hitting tennis balls at Zuni Park. The skills he picked up on those courts enabled him to earn a spot on the boys’ tennis team at Sandia High School. "I’ll always love this sport,” he told me as we ambled about the courts early one a sun-baked August afternoon. The uniqueness of the Zuni Park courts has always stood out. Dozens of tennis courts are embedded in neighborhoods across Albuquerque and are easily accessible. 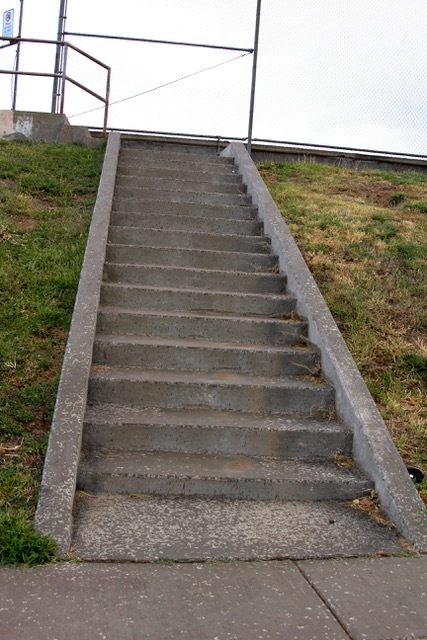 To reach the courts at Zuni Park you have to navigate steps, which vary in number. One set of stairs there presents an upward climb of 22 steps. A sturdy, impenetrable chain-link fence surrounds the entire premises. Thick bands of barbed wire run along the top of the chain-link. Though Victor Tafoya has a soft spot in his heart for Zuni Park, he occasionally grumbles about the tennis setting. “I don’t know why they had to put up barbed wire,” he said. “Look, no one is going to climb over that fence.” Similarly, the entranceway to the water storage facility is marked by a roll of no-nonsense razor wire. A strong sense of Keep Out prevails. Though he no longer plays much tennis these days, Tafoya keeps watch on things at Zuni Park. Regrettably, vandalism happens there as it does at many tennis venues in the city. Roller hockey has scarred the Zuni courts even though signs prohibit roller-skating, bike-riding. roller-blading and dogs. “Sometimes I think the city has pretty much given up on Zuni,” Tafoya said. “No, it hasn’t,” said Dave Simon. 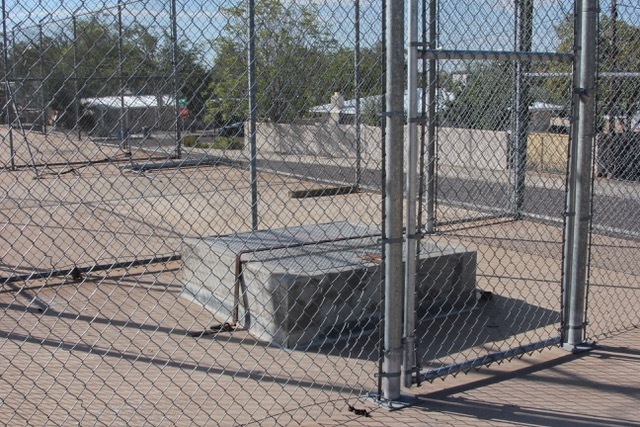 Metal nets were long a fixture at Zuni Park courts as they once were at numerous public tennis locales in Albuquerque. Many of those metal nets have since been removed, to no one’s disappointment. A couple of years ago the city installed cloth nets at Zuni and at other tennis venues. That gave Zuni Park regulars a good reason to cheer. Zuni Park is just about tennis. There are no swings, no jungle gyms, no slides. The park does have two picnic tables sit beneath shade trees. There are also half a dozen iron benches. Keeping with the park’s uniqueness, a couple of the benches stand below court level and thus do not offer a glimpse of who is playing tennis. There are no places to sit down inside the courts. 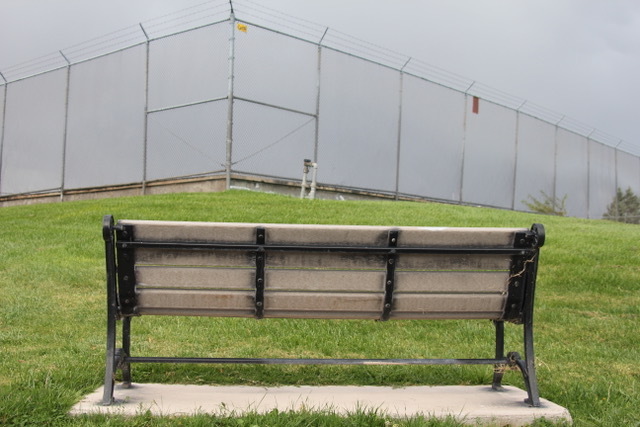 But then several public tennis sites in Albuquerque do not offer benches for spectators or weary players. Fifteen yards from the west side of the Zuni courts stand the Courtside Apartments, named for obvious reasons. The second-floor balcony there offers an unobstructed view of the courts. When I asked Tafoya if any of the residents of the Courtside Apartments use the courts, he shook his head. “I can’t imagine anyone who lives there plays tennis,” he said. A retired APD policeman, Victor Tafoya said that at one point the apartments developed a bad reputation. Lori Romero recalled that she used to see cop cars at the apartments once in a while. That situation has started to change for the better, I was informed. At one time the Zuni Park courts were a curiosity for a wide range of players. Meanwhile, other bigger and busier public tennis sites came along, such as Jerry Cline, Ventana Park and Domingo Baca. Meanwhile, the uniqueness of the Zuni Park remains. Sadly, the Sizzler is gone now, but the Zuni Park tennis courts happily live on.